There is no need to rehash the whole tobacco industry debacle, other than to point out that morality and health do not have a place in the tobacco industry’s continued business. Admitting to the addictive and destructive poisons added into commercial cigarette tobacco and the effects of such poison on human health took over 50 years! The tobacco industry vehemently denied and lied about the disastrous effects of their product and fought tooth and nail to perpetuate this destructive business to this day. They continue to market to children and have made little if any modifications to the product (besides the warning labels) that wipes out vast amounts of human lives every year. According to the Center for Disease Control and Prevention, 5 million people die from the effects of smoking per year worldwide – with the projected stats sitting at an estimated 8 million deaths per year by 2030. Everyday, over 3800 people younger than 18 years of age smoke their first cigarette. Pardon my blunt nature but this, in my opinion, is ridiculous and transitions perfectly into the meat of this Master The Basics Food Lesson: Our conventional food supply has been altered, genetically modified and ‘fortified’ with poisonous toxins! 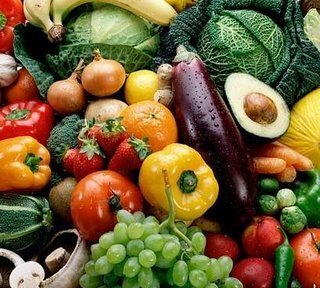 The only way to achieve vibrant health and clarity of mind is to only consume organic food. Plain and simple. If I prepared a beautiful meal for your children and family and you saw me spray some glyphosate (look it up) on it, would you eat it? Would you serve it to your children knowing I just poisoned it? How about if you saw me add a few drops of sodium fluoride to their sippy cups? Would you let them drink it? Your answers are probably no. So why do so many of us continue to consume these things? Is it because we don’t see ’what is going on in the kitchen’ so to say, that we turn a blind eye to what is going into the food and just take it and swallow? It took over 50 years for the tobacco industry conglomerates to admit after lengthy litigation to the disastrous effects of cigarette smoking on human health and to add warning labels to the packaging. How long are we going to keep feeding poison to our families? For the next 50 years until big agriculture has been pressured and litigated enough that they have no choice but to fess up to their criminal negligence and issue a statement that the food *may* be toxic? It’s time for us all to wake up and smell the genetically modified coffee. We are facing the same issue with the food supply here in North America. The good news is that the rest of the world seems to be ahead of us on this one and it’s time to catch up. 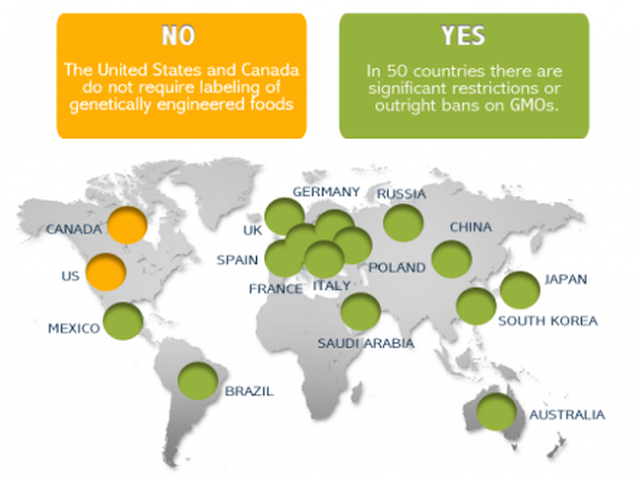 This is made evident in the image shown below outlining the GMO labeling requirements globally. Thankfully, the organic food market has grown exponentially in North America as a result of the conscious awakening that is taking place towards the healing power of organic food and the dangers associated with GMO crops. Funny note: Monsanto (one of the largest producers of GMO agriculture) has banned GMO foods within their own cafeteria! It’s no coincidence that Spain, Germany and so many other countries require labeling or have outright banned GMO foods in their food supply. It is time for us all to wake up. Ignorance is not bliss. Public misinformation has definitely played a role in getting us into this mess but it is not the only factor at fault. Do you now see the correlation between the GMO food industry assault on the mass public and the tobacco industry assault on the mass public? 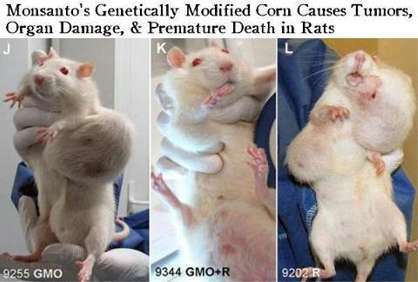 After seeing what happens to rats when fed GMO, are you now still willing to feed it to your kids? To yourself? Look at the results, sure as humans we have a longer lifespan, so the visible effects may take longer to manifest than they did for the rats, but seriously are you willing to knowingly do that to your body? Or inflict that kind of damage on your family? Is that ‘happy’ meal box and commercial on TV distracting and cute enough to trick us into ingesting that rubbish on a daily basis? There has been progress made in the food supply issue. Many are awakening to the importance of preparing our own food and eating 100% organic food. Whole Foods has even announced mandatory labeling of GMO foods in its stores as of 2018. Tomorrow would be better. But still it’s progress. In the meantime, vote with your dollars. You are voting for GMO if you buy GMO, plain and simple. And WE will shift the supply to organic, when WE start buying organic, which essentially is a vote for organic. We are all connected, and a simple ‘switch’ in critical thinking and shift in consumerism is all it takes instigate change. I could elaborate on this fundamental issue for days, but the bottom line is in my opinion you need to consume organic food exclusively in order to thrive and prevent disease. It will contribute to thriving in all areas of your life. Do your own research, the information is out there for you to access. Make the truth mainstream by sharing knowledge with your loved ones, and later the mainstream will catch up. Turn off the TV for a couple minutes and seek knowledge instead of ignorantly swallowing whatever ‘they’ put on your plate. And if you didn’t know, now you do! And when you know better, you can choose to do better. How simple is that? So get to it! Isabelle Beenen is a World Citizen. Independent Writer. Founder of the upcoming Unprogram Yourself TV and Unprogram Yourself Radio. BD for Street Queen Energy Shots. Problems= Opportunities!! I am re-creating my life! This entry was posted in Article, Links, reblog and tagged 2013, 31 March, ActivistPost, Disclosure, Earth, Isabelle Beenan, news, Our Food Supply: What You And Your Family Need To Know, spiritual, Spiritual evolution, World. Bookmark the permalink.